Lets look at the framework behind Sales Pipeline Management. Provided in the following table are the Adventace “no wiggle room” Opportunity Stages along with their definitions. Well-defined surgical Opportunity Stages are the critical foundation to accurate identification of the status of opportunities, Sales Pipeline Management, and forecasting. 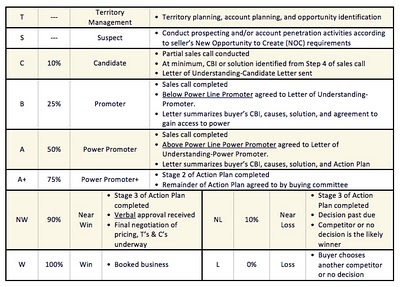 They must reflect key events successfully completed between the seller and the buyer organization (such as access to power, identification of a Critical Business Issue and a solution, and the sequence of events leading to a buy decision). For a detailed review of the stages please refer to our video at Stages. The flow through the stages is shown in the following diagram. The T stage involves planning for prospecting, while the S stage reflects the identification of near-term prospects the seller will call. But opportunities at the C stage represent QUALIFIED OPPORTUNITIES that represent the first stage to be included in the Sales Pipeline. It is qualified due to the fact that the seller has been able to get the buyer to admit a Critical Business Issue. Note that a C opportunity ultimately leads to an A opportunity. The A opportunity is very important because the seller now has a Power Promoter who has agreed to an Action Plan. A opportunities and, in summary, the A pipeline, are an excellent predictor of win probability (at least 50%) and are thus key in terms of predicting revenue goals and quota achievement. As we will demonstrate, the value of the A pipeline provides a key metric for assessing pipeline health. It is also a key to accurate forecasting. But note that there are two paths a seller can take to reach the A stage. We can go directly from C to A, or take the path C to B to A. Very importantly, we DO NOT want to take the latter, through the B prospect, because this is where sellers get stuck “below the power line”. And, as we previously explained, this is why many sellers, and ultimately sales operations, fail to achieve their overall goals. Thus, the B Stage should be minimized. So it is important for executives and managers to make sure that organizationally they are following the correct processes and metrics to take that direct route. For a deeper look at this please take a look at our video on performance metrics. In Part 3 we will demonstrate how to do Sales Pipeline Management through use of a Pipeline Balance Algorithm. Stay tuned!